Festive Friday Blog Hop Design 7 | Who Are You Calling Crafty? Snow Theme Card #7 – This card took a lot longer than I had expected. The card is a vertical card 4 1/4” x 5 1/2” when folded and was constructed on Blue card stock made by Canson (I have had it for years!) I do not have templates for the ornaments (baubles) so I made my own “template” out of notebook paper. I then traced the “template” onto an old cereal box. I added the Dollar Store Paper – Special Memories to the cereal box. I embellished the ornament with a Pony Bead and some Glitter Glue. I covered another piece of cereal box with metal tape and used that as the hanger. The LET IT – tag is metal from a tea light candle tin that I stamped with my metal stamps. 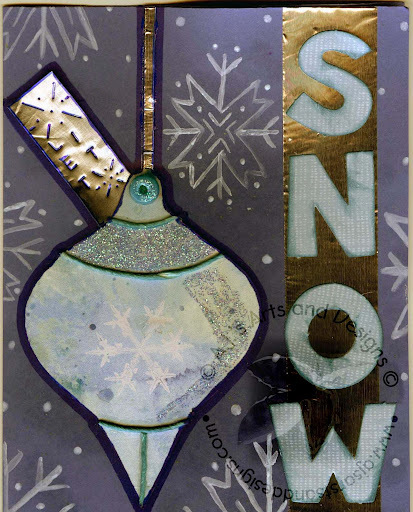 The SNOW base is metal tape the letters are pop-out letters that I inked with Tim Holtz Broken China Distress Ink. The cord used on the ornament was recycled from my daughters newest Littlest Pet Shop house that I dyed with homemade blue alcohol ink. I also embellished the ornament with light blue Studio G Glitter. The snowflakes in the background were painted with Titanum White Liquitex Paint.